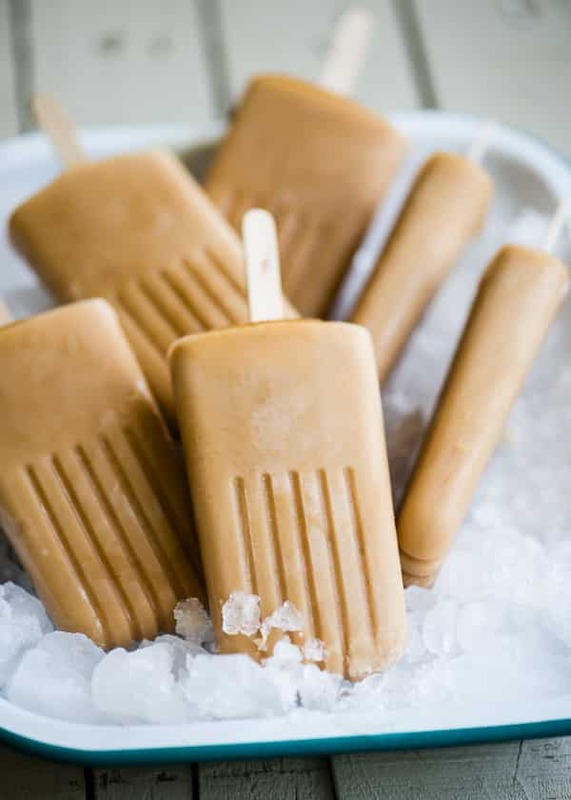 Vegan and Dairy-Free Thai Iced Tea Pops Recipe from Oh My Veggies! If you’ve ever ordered Thai iced tea while dining out, a few things probably occurred to you. First off, you probably noticed that it tastes more like a dessert than a simple dinner-accompanying beverage. Secondly, you were probably floored at the drink’s deliciousness and wished you could make it at home, all the while figuring you couldn’t make it at home because it’s full of exotic Thai secrets that you could never access. Thirdly, and this goes along with my point under “secondly,” you probably noticed that it was orange, attributing that fact to all those exotic Thai secrets. Today I’m here to unlock the mystery of Thai tea for you. That, and to give you a recipe for a killer summertime sweet. So, what exactly is it that gives Thai tea its distinct flavor? Well, there’s the tea for starters. It’s strong, so that’s one thing. Notice this recipe calls for eight tea bags in six pops. I wouldn’t recommend giving these treats to your kids, unless you’re into flying kids. Then there’s the tea itself, which is black tea of the Ceylon variety. Using Ceylon does seem to add a slight distinctness to the flavor (I tested this), but regular black tea works as well. There’s also loads of sugar (higher flying kids? ), and in conventional Thai tea, condensed milk. That’s it! “Then why is it orange?” you ask. As it turns out, most restaurants add orange food coloring to their Thai tea. I was a little disappointed to find out that it wasn’t exotic Thai magic. So these Thai Iced Tea Pops are not orange. They also contain coconut milk in place of condensed dairy milk, so they’re vegan! The coconut milk content is also a bit higher than it might be in Thai tea you drink, because they’re dessert. They are also incredibly delicious, which is why I’ve been eating them like crazy and have been flying Alissa for the last week or so. Thank you Thailand. It’s been a VERY productive week. This post was originally published on July 10, 2014. Sweet and creamy Thai iced tea, in popsicle form – and vegan, to boot! We can’t think of a better way to cool down. Remove from heat and add the tea bags and sugar. Stir until the sugar dissolves, then let the tea bags steep for 5 minutes. Remove the tea bags from the saucepan, or strain the mixture if you used loose tea. Stir in the coconut milk. You can heat it back up, if necessary, to dissolve any stubborn chunks. Transfer the mixture to the refrigerator and chill until it’s at room temperature or a little below. About an hour should do it. Remove the saucepan from the refrigerator and give the mixture a stir. The coconut milk and tea may have separated a bit during refrigeration (or a lot, if you left it in there for a while), so just stir it enough to bring the mixture back to uniformity. Carefully pour the tea mixture into your popsicle molds and freeze until solid. Remove from molds and serve. The refrigeration step helps prevent separation during freezing. Coconut milk typically separates into cream and water during chilling. 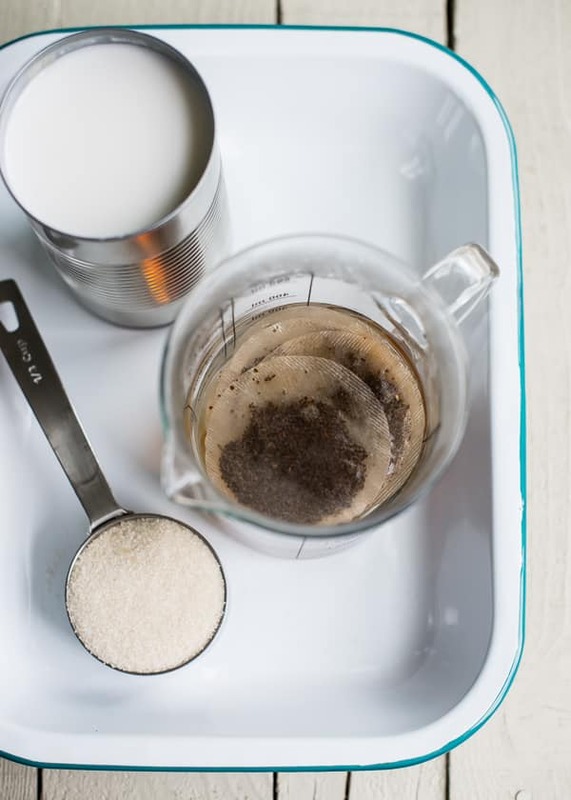 By refrigerating and then stirring the mixture before freezing, you’re essentially shortening the freeze time of the mixture, and in turn its opportunity to separate before freezing solid. Also, the number of servings here assumes you’re using a 1/2 cup mold. This will obviously vary if your molds are bigger or smaller. Genius!! I’ll definitely be making these and I won’t have to worry about the Mr snatching them since he’s not a tea person. More for me! Haha, great! Sounds like you’re in for a productive week as well 😉 Enjoy!! I love Thai iced tea, so I’m going to need these ASAP! If you like Thai iced tea you will LOVE these! This sounds incredible. I’ve never had Thai Iced Tea but definitely want to make these popsicles! Thank you! Thai iced tea is great – it’s amazing how a few little modifications over regular tea give it a distinctive flavor. I hope you enjoy these! Thanks Olivia! They really were refreshing and tasty! These look delicious! I’d love to know which type of popsicle mold you’re using. I’m struggling to find one that works well! Thank you! I used the Tovolo Groovy Ice Pops Mold. It works well for me. The trick is to be patient when removing the pops from the molds – it sometimes takes a minute or so of running under hot water, but the pops always come out just fine. I’m curious if you’ve ever used the ZOKU pop makers because I’m debating whether or not to buy another of those (after none broke! ), or try something new. These look super dee duper tasty, by the way! Oh my goodness! I had no idea it wasn’t actually orange!! I too thought it was some exotic tea, how funny! What a great dessert! These look so good! I have been craving ice cream lately due to the heat, but this is a healthier and more frugal choice. Thanks so much for the recipe. I love all things coconut. Coconut milk is my favorite for ice cream and smoothies. Pinning this now! Thanks, again. Thanks Heather! The coconut milk makes these really creamy, so they should satisfy your ice cream cravings. Enjoy!! Oh I am SO going to make these! I make a Thai tea smoothie and Thai tea pudding that we love. So having another delicious Thai tea treat has me very excited. YAY! I can’t wait to try these!!!! I LOVE Thai iced tea but it’s a rare indulgence as it’s not exactly healthy. These sound amazing. :). Thank you! I am having so much fun exploring your recipes! Your website is a gem! Thanks Alice! I wish I had some tips, but I’ve never had a problem getting pops out of the molds! I just run the mold under hot water until it loosens. Sometimes it takes a minute or two, but they always come out for me. great healthy version of thai tea pops! Now I’m dreaming of Thai iced coffee pops…rather than the iced coffee I’m about to get. Love this idea!! I have definitely always wondered a little bit about that orange color. Mind you, that has never stopped me from ordering a Thai iced tea every chance I get! Licking into one of these shall be the pinnacle of my summer! Especially since the boyfriend DESPISES tea. So more for me. Yeah, I have to admit, I don’t think my newfound knowledge of the orange coloring will stop me from ordering in the future…Thai iced tea is just too good. Glad I can now supplement at home with color-free pops 🙂 I hope you enjoy these! Thanks Dana! I hope you enjoy them as much as I did! Who knew they could be so simple-and vegan! Yeah, baby! I was surprised myself at how something so simple turned out so tasty! I thought they were pretty delicious. 🙂 Thanks Shaun! Perfect for a warm afternoon! Delish! Oh my gosh these look so good! Thai ice tea is one of my absolute favorite things and I couldn’t agree more that it tastes more like dessert. Definitely want to try these pops! I love Thai iced tea, and think this would be a great way to enjoy it since we’re going to have 100º+ temps this week. My husband is diabetic. Are there any sugar substitutes you would recommend to use instead of regular sugar so I can keep down the carbs? You could really go with whatever sweetener works with your husband’s diet. I like liquid stevia, so if that’s suitable for him you could give it a try. I’d just add a few drops at a time until you get the flavor somewhere on par with a glass of sweet iced tea. Enjoy! Holy cow these are amazing! I made mine with Celestial Seasonings Bengal Spice Tea instead black, and it is to die for.